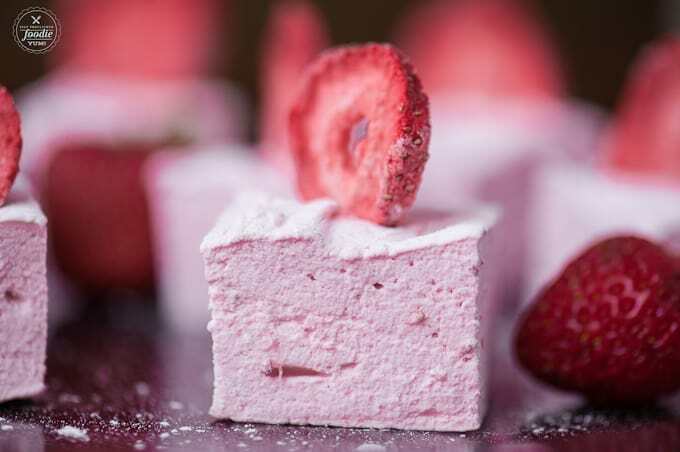 Homemade marshmallows are a real treat, and these Strawberry Marshmallows made with fresh strawberry puree take them to a whole new level! These will blow your mind. I’m not kidding. 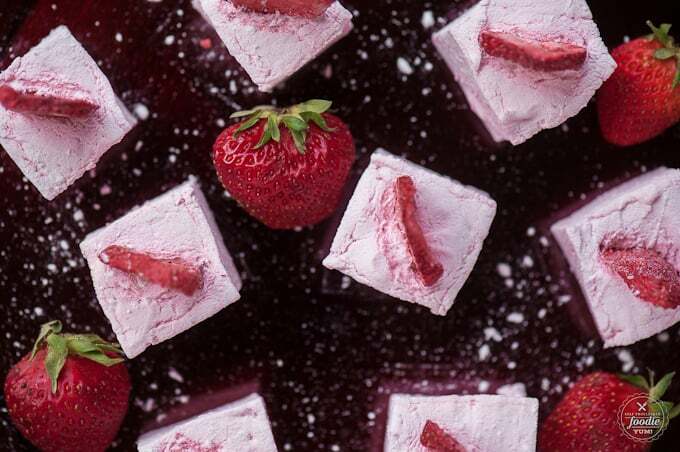 If you love marshmallows, heck – if you even just like these, you will be shocked at what a delicious treat these strawberry marshmallows really are. I made marshmallows the first time when I was preparing my Christmas treats. 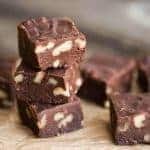 Every year I make a huge variety of bite sized goodies that I package up and send to family. In addition to my time honored five minute fudge and chewy molasses cookies, I made peppermint marshmallows for the first time. The art of making candy, rather the act of boiling sugar, has always terrified me. I got terribly burns when I was younger when trying to glue pieces of a homemade gingerbread house together using boiled sugar. Well, I’m so happy I overcame my fear that year to make those holiday marshmallows because not only was the finished product amazingly delicious, but they were actually rather fun to make! I have bought countless pints of fresh strawberries at the farmer’s market already this year and despite our best efforts to eat as many as we can, I always buy more than we can possibly eat on our own and then have to incorporate them into a recipe or two. If you’ve been following my blog lately, you’ll know it has been saturated with strawberry recipes. I had the sweetest, most luscious, ruby red Hood strawberries and didn’t know what to do with them. They’re so sweet and juicy that they’re not the best for baking. 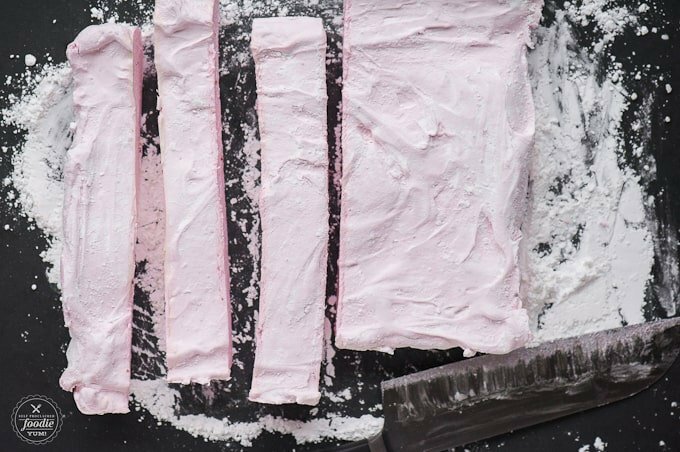 My friend, how happens to be one of the most talented bakers I’ve ever met, told me to make strawberry marshmallows. My initial reaction was “say what???”. I had no idea such a thing was possible. She told me just to bloom the gelatin in strawberry puree instead of water. She told me I could also add a bit of beet food coloring and strawberry extract to bump up the color and flavor, but I had neither. Instead, I just altered my peppermint marshmallow recipe by reducing the amount because I wasn’t giving these away as gifts (but in hindsight I’m wishing I had made more because they’re so dang good) and swapping out some of the ingredients. The entire time I really wasn’t sure they would turn out… but they did! Amazingly so, at that. 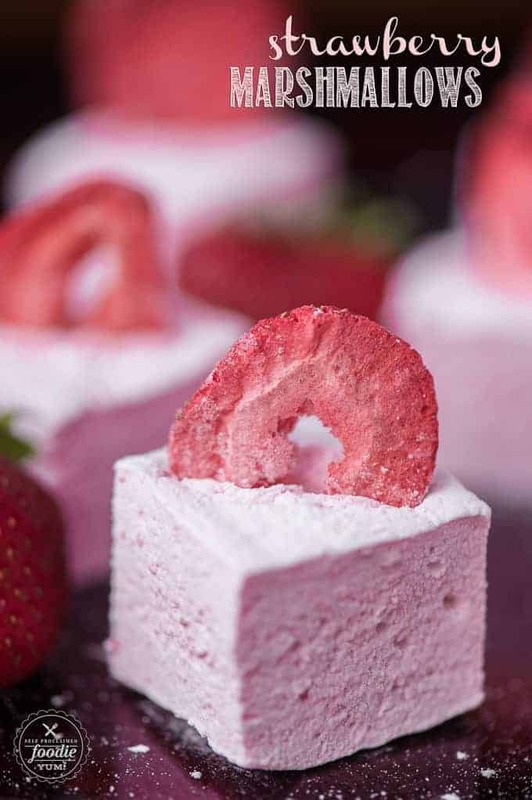 I topped my finished marshmallows with freeze dried strawberries for extra crunch and flavor. Oh my. And guess what? I hid them from my kids after they got their original sampling and will surprise them when I break them out for the s’mores feasting during our camping adventure next week. If I happen to get a photo of the strawberry s’more, I’ll be sure to come back and post an update! To make the strawberry puree, wash and hull your strawberries and then blend on low speed until a smooth puree forms. 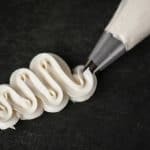 In the bowl of a stand mixer, combine the gelatin with the strawberry puree and give it a swirl to ensure the gelatin doesn't clump. Let sit. While you're mixing the marshmallow, combine corn starch and powdered sugar in a separate bowl. Spray an 8x8 inch baking dish with cooking spray as well as a rubber spatula. You can line your dish with foil ahead of time, if you wish, and then spray the foil. Add about 1/3 of the sugar and corn starch blend, then shake the pan to evenly coat the bottom and sides. 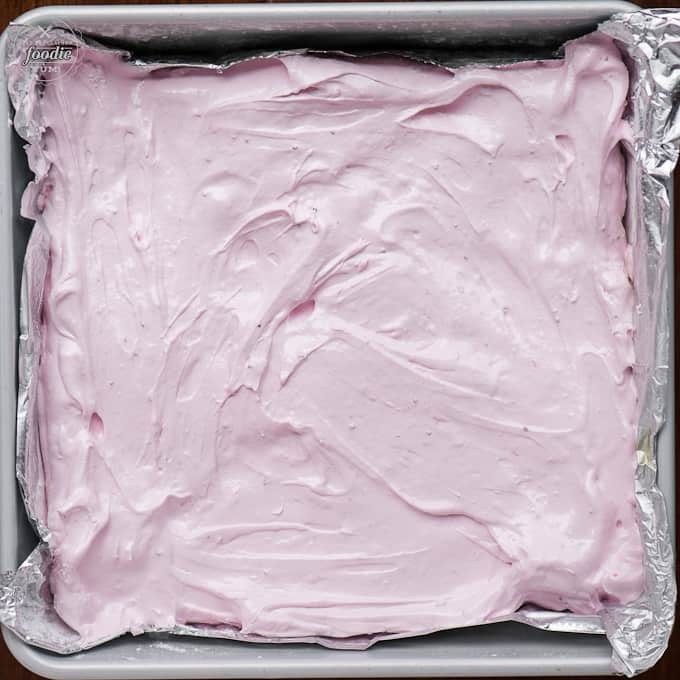 Use the spatula to transfer the marshmallow mixture from the bowl to the baking dish and spread into an even layer. Top with half of the remaining sugar and corn starch mixture, and spread it across the top to cover. Allow the marshmallows to sit uncovered 4-10 hours (I let mine sit overnight). 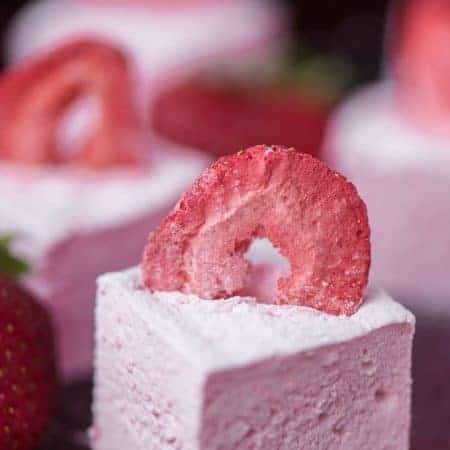 If using freeze dried strawberries, cut a small opening on the top of each marshmallow and press a strawberry piece inside. 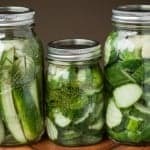 This looks and sounds amazing and I really want to try it but I don’t want to use corn syrup – what could I substitute? Maple syrup? Rice syrup? I have made marshmallows with maple syrup instead of corn syrup and they are delicious… Bit much softer. They won’t hold up well to roasting, but nature a good treat. 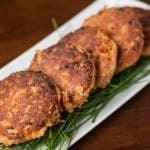 Yummy recipe. What is the shelf life of these marshmallows?